← Congratulations Week 11-25-13 Giveaway Winner!! Since last we met, I am still J. Morgan. Things like that just don’t change, unless I went into witness protection or something. That hasn’t happened so I’m still me, just more me. More you ask? How can that be? Well, now I’m Grandpappy J. Morgan. Yep, but don’t think that will make me a kinder gentler Jmo. Okay, it has, because I say goo goo a lot now. I don’t remember saying it much before. I could have. As a writer with tons of us life experiences, I’m pretty certain I had a goo goo period before now. Still, I don’t see it cropping up in my books any time soon. Until that happens, I think I’ll continue bringing the funniest vampires and werewolves you’ll ever read. I’ve told the story so many times, even I’m bored with it. So instead, how about I go with how did I get started writing my latest book, the second book in my Bite Marks series. Easy, as I sat watching a Storage Wars marathon an idea occurred to me. What if a vampire got locked up in a storage unit? Better yet, what if a vampire slayer found said vampire in that locker? From there a book was born. The writer was there already so I can’t really take credit for it. The book on the other hand says the blame lies fully at my feet. I write the funny side of things that go bump in the night. I don’t know why exactly. I guess I just like making fun of stuff that scares me. What can I say? I can’t afford therapy and writing seemed easier than actually being normal. Honestly? Avoiding writing. There is nothing that is more fun than playing with my friends. Then, when they least expect it, snatching their muses and running for my computer. Man, do they get mad when they find out. When my friends find out I stole their muses. You know authors can get downright vindictive about things like that. Uh, my friends. Not to mention popular media, and my own warped imagination. Seriously, my ideas come from a lot of places, and not even I can tell you when something might inspire a story or even a scene. The experiences that went into propelling me into a career where I went from living inside my own imagination and forcing others to go with me. No writer can be anyone other than themselves and that comes through in their writing. I breathe books, and sneeze misused grammar. It’s an allergy. I can’t help myself. Seriously, I love to read. I truly can’t claim to have a favorite genre to read. There is so much to love about every one of them that picking one is too hard. I couldn’t hurt any of their feelings, so please don’t ask me to. My newest book is Bite the Neck that Loves You, the second book in my Bite Marks Quintet. Well if, I get technical, it’s the eighth book in my Vampire series, but I’ve got a real good reason for breaking it up like I did. Think of it like this. What if Jmo wrote Lord of the Rings with funny vampires? Okay, that didn’t make sense to me either, but I’m still going with it. 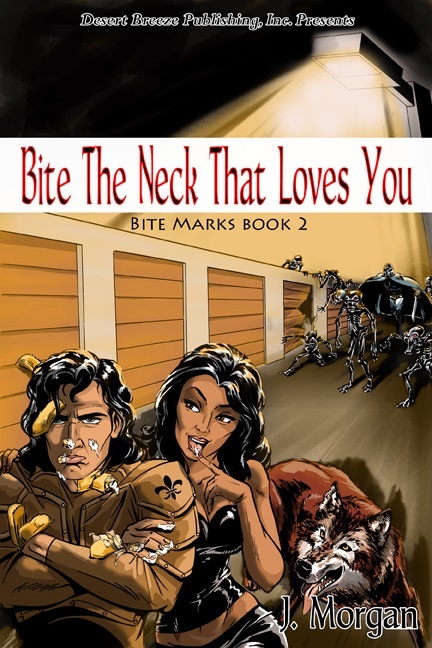 Bite the Neck revolves around Franki, a vampire slayer, who was sent to find a lost Vampire, who fights on the side of good. Like I mentioned earlier, the book starts at a storage war unit and literally leads them around the world, and some parts that aren’t technically in this world. This book also closer ties my vampires to the werewolves in my Southern Werewolf Chronicles. This book also blows apart some secrets that have been rolling around in both series for awhile now. Needless to say, this is going to be a fun one. I know it was to write. BE SURE TO COME BACK to read more about J. and his release, BITE THE NECK THAT LOVES YOU, on Wednesday’s Karen’s Killer Book Bench!! Happy Reading! How on earth did you come up with such a great title? The cover fits the title perfectly. Thanks Gerri and Paisley. Coming up with titles is part of the fun for me. With the Love Bites series, I played with movie titles to come up with the ones for the books. With Bite Marks, I went with song titles. Movies and music are two of my loves in life.When the third series within a series happens, I’ll have to see what strikes my fancy. Wink. I have been looking forward to this one for a while now…ever since you mentioned it somewhere like …oh maybe on facebook or something. Can’t wait to get my hands on this, because I want more of your quirky characters.